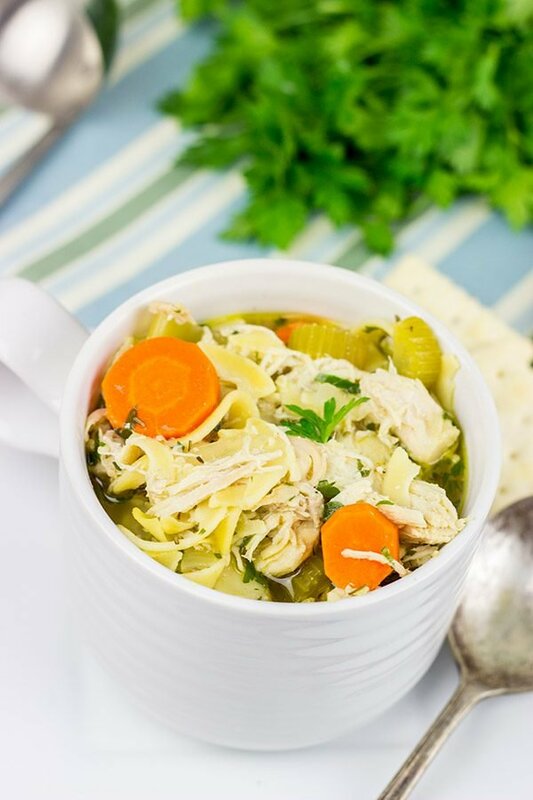 This Slow Cooker Chicken Noodle Soup is perfect for cold winter days when you just want to curl up on the couch with a good book! In addition to artwork and smart phone notifications, Robbie also brings him some less desirable things from daycare. As any parent out there knows, school is a breeding ground for all sorts of creeping crud. It’s not the school’s fault. It’s just what happens when you have a couple hundred kids together in one building. Robbie has definitely brought home his fair share of colds, and then he promptly passes them along to me and Laura. Awesome. Whenever I get sick, I want soup. Other food just doesn’t sound that appetizing. But soup sounds amazing. Maybe it’s because that’s what my Mom gave me when I got sick as a kid. Who knows? But all I know is that soup is the epitome of comfort food when I’m feeling a bit under the weather. I’ve been loving our slow cooker lately! Laura walked in from work last week, and saw this Slow Cooker Chicken Noodle Soup sitting in the slow cooker on the counter. Her response was, “Well look at you, June Cleaver!” I guess it is a bit June Cleaver-ish, but I prefer to think that my slow cooker addiction is more rooted in laziness. Lazy might not be the right word, but I can essentially do all the work for dinner in the morning (or even the night before), and then I don’t have to think about it again. And by 6pm, I have a nice, steaming bowl of Slow Cooker Chicken Noodle Soup waiting for me. Sounds like a win-win right there! 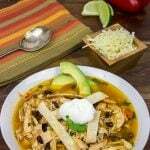 What are your favorite slow cooker soups? What is your go-to food when you get sick? Using a standard slow cooker, place chicken on bottom. Top with all remaining ingredients except for egg noodles and fresh parsley. Cover and cook on low heat for 6-7 hours. 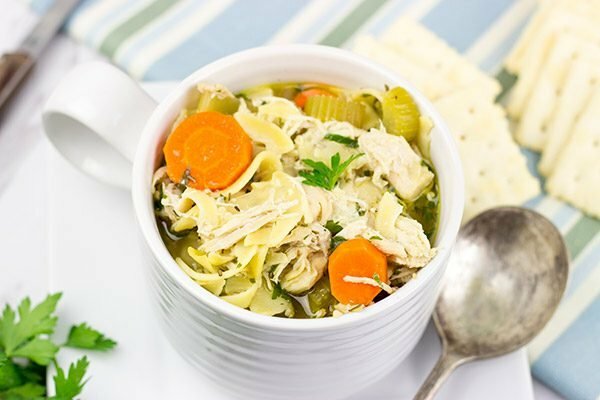 We sometimes add 1½-2 tsp of chipotle powder to this Slow Cooker Chicken Noodle Soup. It's an optional add-in, but man does it add an amazing depth of flavor to the finished pot! I’m not sure there’s anything more comforting than chicken noodle soup; perfect January food. I couldn’t agree more, Caroline! Nothing beats a bowl of chicken noodle soup. Except maybe chocolate cake. 😉 Hope you had a great holidays over there! You know, when I get only a 30-minute nap, I’m pretty cranky, too. And another coincidence: you were making chicken soup while I was making dumplings for chicken soup! What? Want to come over? So Westworld. We actually just started watching it, so we’re only 2 episodes into the 10. I like it, but man is it weird. I’m having a bit of trouble getting into it, but I do think I’ll like it once I get the storyline a bit more. Same with Timeless. Not as good as the HBO/Netflix shows, but still worth watching…mainly because I love history. And I couldn’t agree with you more about soup! As soon as we roll out of the holidays, I always have a craving for soup. And that craving lasts well into March. It’s just so easy and delicious! Those apps are crazy these days. Something for everything! As for that slow cooker, mine is in HEAVY use these days. Agree that dicing onions and dry rubbing ribs might be funny at 7AM, but the payoff later is awesome (plus the aroma wafting down the hall as I work is great!) I think I’ll take a bowl of this and two of Jeff’s dumplings to go! Yeah, those apps really are nuts, Kevin! 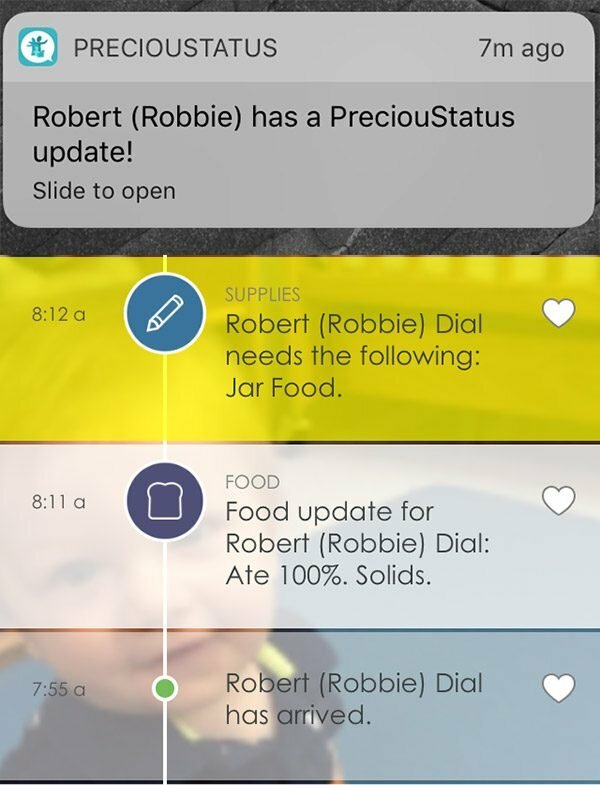 But I do like being able to track Robbie’s day while he’s off at daycare. I’m right there with ya on the slow cooker! 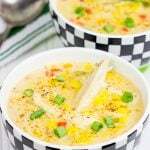 I made this soup right before the holidays, and now I’m ready to get that slow cooker back out for some more easy meals. And yes to Jeff’s dumplings…those bad boys sounded amazing! Wow that sounds like an amazing app, technology blows my mind sometimes! Happy new year David! 🙂 The soup looks very comforting! I’m now staying in Dongguan, China where I am digging into many bowls of noodle soups every week. My favourite one is chicken and onion and I really wonder how it would taste when I made it home. I’ll try your recipe once I’m back in my apartment, for sure! Have you ever visited Asia? Happy New Year! I could definitely use some of this soup! The temp outside right now is 1 degree….plus add a wind chill to that and all I want to do is stay by the fire and eat warm food! This soup would fit the ticket! Wow…1 degree? Now that is cold! And it’s way too early to be that cold. (Usually that kind of stuff is reserved for late January/February in these parts…) Sounds like soup + fireplace definitely needs to be in order for you, Kathy! 🙂 Happy New Year, my friend! Wow! Daycare has come a long way in the last few years! At least you know what kind of a mood Robbie will be in when you pick him up! 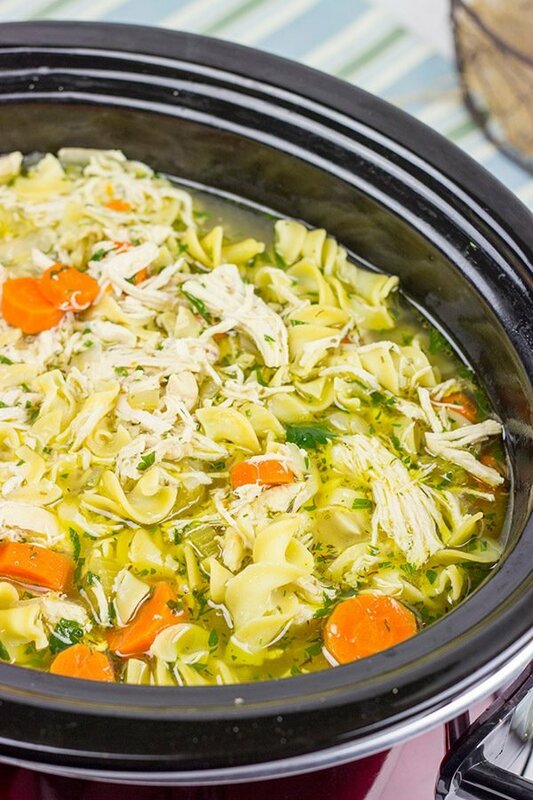 I sure would love to come home from work and find this chicken noodle soup ready to go in my slow cooker! Yeah, tell me about it! That daycare app is insane, Rachelle. Heck, they even have an option on there to send an alert about Robbie’s mood. The other day I got a “Robbie is feeling curious today.” Hmmm…to me, that means he’s getting into all sorts of stuff that he shouldn’t be! 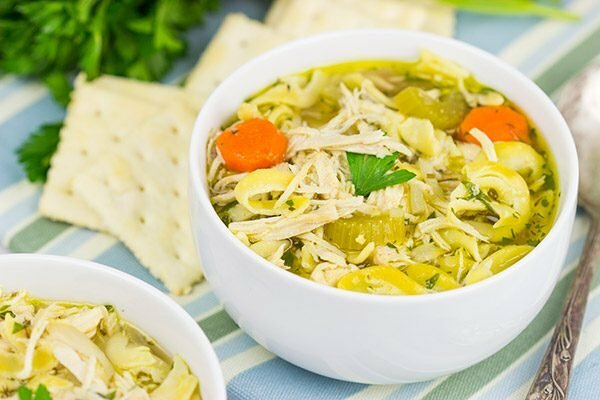 🙂 I’m thinking you just need to make this slow cooker chicken noodle soup happen. And make sure to put on jammy pants first! Slow cooker soups require jammy pants. Good golly – I remember Lil Shashi bringing home those notes on paper when she was a toddler – I’m in awe that they are delivered via an app these days! Too too cool! And you aren’t wrong about those little people’s “generous” ways when it comes to germ sharing! I was around a bunch of friends’ kids a couple days ago and they “shared” a bug with me and let’s just say I haven’t been quite this sick in about 5 years! 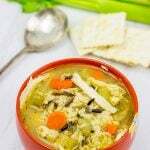 This soup would have been perfect – especially seeing I could have just thrown everything in my slow cooker! I ended up making a big batch of 2 bean and spinach soup loaded with garlic and turmeric last night – soup is my go to when am sick too – or just cos it’s gloomy outside! Happy New Year, David! Hope ya don’t have much shoveling to do this winter! Tell me about it, Shashi! I mean it makes sense that everything goes electronic…but the day care notes is pretty funny still. But I do like that I can constantly monitor what’s going on with the little guy throughout the day. Oh no! So sorry to hear that you’re sick. Booooo! I’m hoping that bean and spinach soup helps you get over whatever creeping crud found you. And I hope lil Shashi has managed to avoid it…that way she can warm up the soup for you! Hang in there, my friend. Being sick is no fun. Also, if you get bored this winter, I have a shovel and some snow with your name on it. You know where to find me! Who wouldn’t be a little grumpy after having just a 30-minute nap, David? I would. That’s why I don’t take a nap less than an hour (or longer). However, it doesn’t always guarantee that I’m in a good mood after a nice nap either:) But I can guarantee this simple, hearty, and delicious soup is exactly what I need after all the festive food:) Happy New Year! Me, too, Ben! Anything less than an hour in the nap department is usually trouble. Of course, naps come far less often now that Robbie is around…mainly because his naptime is when we have to get the normal household chores done. That’s why easy meals like this slow cooker soup are perfect…especially on these cold winter days. Happy New Year to you, too, my friend! How nice that you get updates on Robbie’s day – incredible how technology changes our lives in this case certainly for the better 🙂 You are going to be very rich one day with all of that artwork going on already! We have only recently started to watch Westworld, fantastic series and such great acting – I can see myself enjoying a bowl of your chicken noodle soup while watching. When I feel a bit under the weather a home made chicken soup always does the trick as well as a glass of hot ginger tea. Wishing you and your family all the best for 2017! We’re still early on in Westworld, too, Miriam. Good show, but man that premise is a bit out there. Either way, I’m looking forward to seeing where that one goes. Hope you’re having a great week over there…thanks so much for your comments! 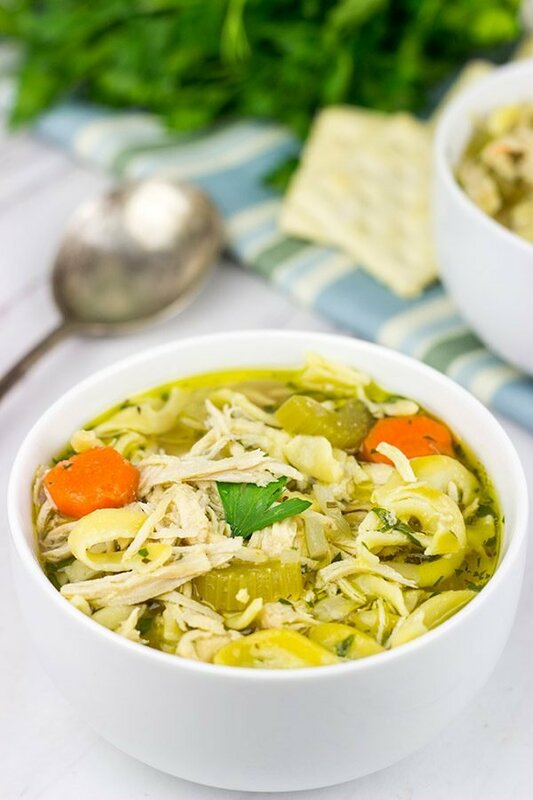 I got sick on my vacation to the East Coast, so I would love a big bowl of this Slow Cooker Chicken Noodle soup. I remember the days my mother would get up early and brown meat to go into the slow cooker; the house was so savory I wanted to eat dinner right then and there. I would rush home from school excited about the masterpiece that lay simmer in that crock pot. Happy New Year David! Oh no! So sorry to hear that you’re sick, Mary. That’s the worst! But it always seems to happen when you fly in the winter. Ugh. A big bowl of this soup is definitely in order for you then! Hope you get better soon…and Happy New Year, my friend! Now this soup will ward off all those unfavorable ‘gifts’.